Once the Season is over? I sat out and just watched, as my sciatica is getting better, but still acting up,. If my sciatica wasn’t acting up, I would have paired this outfit with orange pumps to bookend the scarf.. The brown fur vest I purchased as my first reward for my weight loss and cherish it for that reason..
Dear Readers, I hope you all had a wonderful weekend! As I’ve mentioned before I receive no compensation for this blog. I am grateful that the headache I had for the past few days was completely gone today! I am grateful for a relaxing laid back two days. I am grateful for a sunny, breezy warm day in the coldest month of the year! 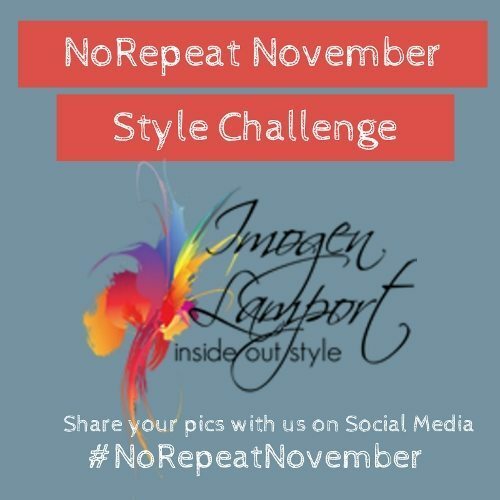 It doesn’t mean no repeat of an individual item, just not repeat of an entire outfit. More Information can be found on the site. I’ve had this outfit sitting in the front of my closet for a busy day to grab and go and today was one of those days! 3 times within 15 minutes of walking in the door. I loved the chance to wear my cobalt pumps two days in a row! My necklace was bought on my Grand Caymans Vacation and reminds me of fun in the sun! 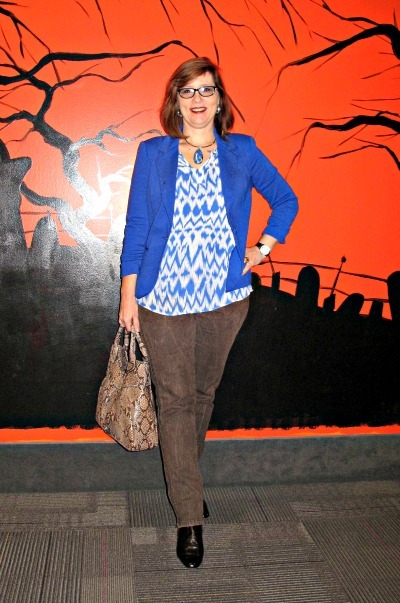 It was nice to pair something besides black , grey or yellow with my cobalt tribal print jeans by Diane Gilman , which is how I wore them last year. Dear Readers. life at this stage is so full of changes and today was the last year we will take a child Trick or Treating. A sad chapter to close… There could be even bigger changes ahead and I cant get it out of my head that by next Fall, my three oldest will all be out of the house going from a family of 6 to just 3. How will I cook for so few people??? How quiet will it be without everyone talking over each other. How special will it be for our youngest to have our full attention? So much to ponder, miss and look forward to , Hope this much change doesn’t hit me too hard…. Tom sporting his Red Sox Fan beard that he wore during each of the World Series Games. 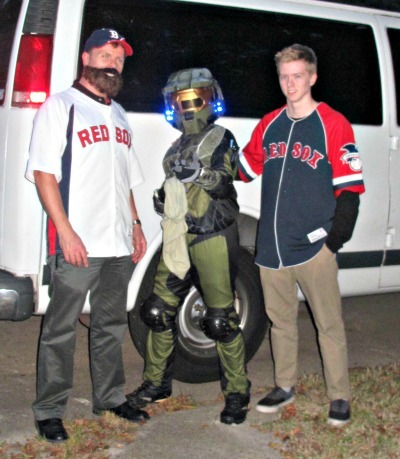 In the middle my youngest in his Halo costume with his empty pillowcase ready to fill up! And my almost 18 year old son , Ncholas humoring Dad, by wearing a jersey. One last picture with the pose he chose! 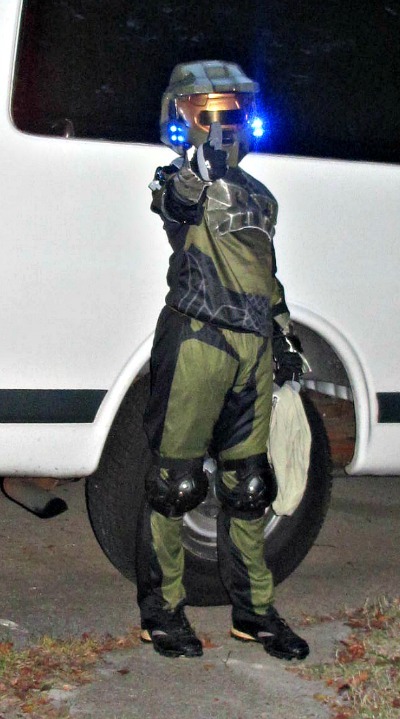 He loved this costume from last year so much he wore it again! I am grateful that my husband took off work to be able to go trick or treating. I am grateful that Nicholas was kind hearted enough to go with Connor when he asked. I am grateful that my brother was so forgiving for my acccidental 2 am cell phone dial that woke him up. I am grateful that we have found a great car mechanic who comes to the house. I am grateful for the family fun we had trying out the new log splitter, boy what a workout! 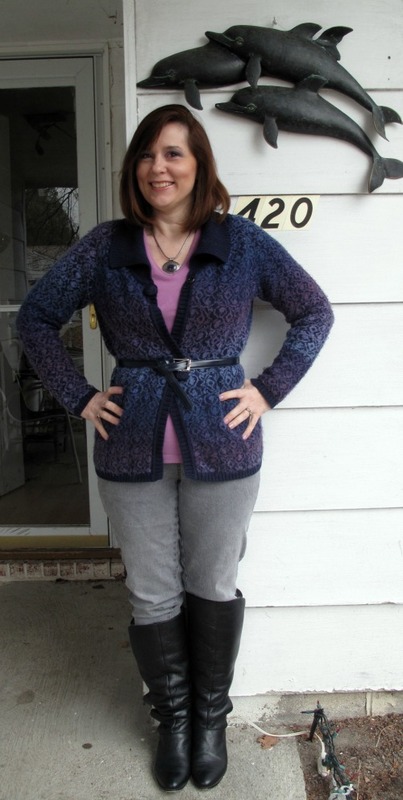 I just love my purple leoapard spotted jeans by Diane Gilman, I dare say this is my favorite jean. I thrifted this purple poncho by Old Navy and love that it is a great length for my petite height and doesn’t overwhelm me. Happiness Factor is super high with this enseble. I tried cuffing the jeans but liked the longer leg line it gave me without it. I tried to get a close up of the necklace to show that it is actually a pin of my mother’s . Purple was her favorite color and I’ve gotta say i love it myself! Dear Readers, I had fun putting this “wake-Up” inspiration together. 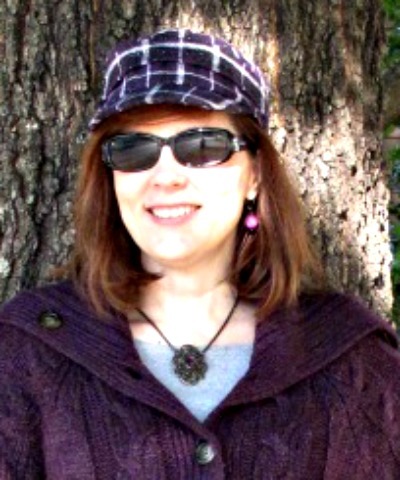 I am so happy Fall and layering has arrived. I can’t wait to start putting together more skirt and dresses look and getting all my boots into circulation. I hope you all had a wonderful weekend! Can you beiieve we’ve had nightly lows in the low 40’s and Halloween is expected to be close to 80 again…. I am grateful for my mind and the inspiration that came naturally for today’s outfit. I am grateful that my oldest wrinkled his nose at my look , as he does at any of my more bohemian ones.. I am grateful that my youngest without prompting, immediately complimented my outfit. I am grateful the my husband made the family breakfast while I slept this morning. I am grateful for Football Season , even if my team lost ….It never ceases to bring me memories of watching games with my father while we peeled carrots and potatoes for Sunday roast. seems like Cobalt is more popular right now! Spent the day at the mall with a friend and her daughter! All the pics for today are by 7 1/2 year old “niece” . I bought nothing today, can you imagine???? I really love these brown jeans by Diane Gilman with the zippered sides….bought last year and worn a lot! I also think I forget how versatilve my snakeskin purse can be…. I feel gulilty sometimes that I can’t lead you to my purchases, but as a bargain shopper, most are found on clearance and gone before I can do so… I hope that my style is inspiring in colors, cuts and combinations that transfer to others. Love that I can take a sheer top and layer it with a jacket to make it more versatile and work for more than one season! Dear Readers, i love spending the day with my best friend and her daughter and due to chaos in her life and my homeschooling schedule we’ve gona a month without seeing each other. I hate that and apparently so did her daughter who privately chastised me and told me I was her mother’s best friend…. Hope things calm down and we can do better going forward as I know that it’s not just about my freindship, I am Auntie Tracey to this little girls as well. Okay, obviously the first one has to be spending the day with my friend and her spunky daughter! I am grateful that the rain died down and I was able to walk across from the Mall to take the little one to a movie while her mother was taking a test for a job. I am grateful that my DD cleaned the kitchen for me today since I was goine unitl 8 pm! I am grateful that my youngest did the homeschooling assignments I left for him. I am grateful that tomorrow is Friday and the weekend is almost here! I am grateful that “my niece” trusts me and told me something she needed to get out and asked me to share it with her mother! Well the Temperatures dropped and it is a miserable wet and cold Thursday. What better way to cope than to find my cozy sweater, a pair of skinny’s and fur lined boots… May not be the most fashion forward look, but works for this kind of day! I apologize for the quality of photos we took them on the porch to stay dry and the lighting wasn’t great! Did I mention that big drops in temperature wreak havoc on sinuses, so woke up to pain when I moved my head. No worries there though I took some great medicine and it went away. It just makes mornings go a little slower.. Must be why we didn’t start home schooling until 11:30 am.. Notice my metal dolphin sculpture. It was a birthday gift from my mother and I cherish it! The weather update has changed and what was originally suppose to be an inch of snow was predicted to be 2 to 4 inches. For Virginia Beach that is a big difference. Then, later the forecast changed and it was north and west of us, we didn’t get anything. Oh apparently it snowed but melted immediately as it didn’t get quite cold enough. That is the constant story here in Virginia Beach. My daughter who is at Longwwood, north west of us had several inches but it should melt today…A huge disappointment for my 17 year old who had to go to school on time while cities all around us were delayed two hours… I decided to pose in my purple puffer coat (currently on clearance at QVC) and Sporto boots. If I have to have a puffer to keep me warm, at least it has to be in a Fabulous color! I never wear this coat without the scarf down the front, I think it helps to make it more fashionable. At least that is my delusion and I am sticking to it!!!! As a follow up to yesterday’s Paisley post, fellow blogger mentioned they were getting in paisley items in her Dressbarn store, so I looked online and they have a total of 88 Paisley items right now! 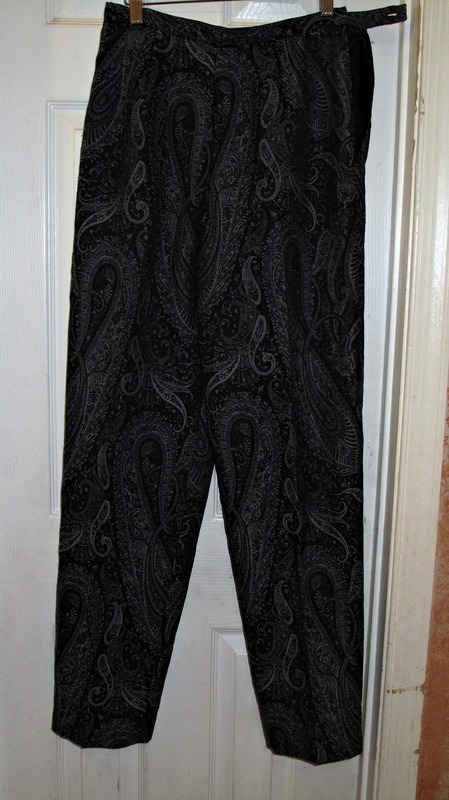 I also realized one of my two pairs of Talbots printed slacks are in Paisley too! Gratitude: My daughter’s psychology professor called her business partner and vouched for my daughter and she was given an internship!!!! I am grateful that my daughter, Ashley is so strong and focused, as this final semester at Longwood University is going to be her toughest yet with an internship and a professor who required her to do community service hours. I am grateful to have had the strong mother who fought the school on things for us and set the example for me to do the same, as I have a meeting with my son’s Principal and a fight on my hands…. As always, my dear readers, your comments are welcomed and appreciated. Come back tomorrow and see my look of the week in my Red-Orange Jeans. Since I finally decided to go ahead and purchase skinnys as I feel closer to my goal weight… I have added this new color! How lucky am I to have a friend who gave me this fabulous Dooney & Bourke in this same red-orange color! 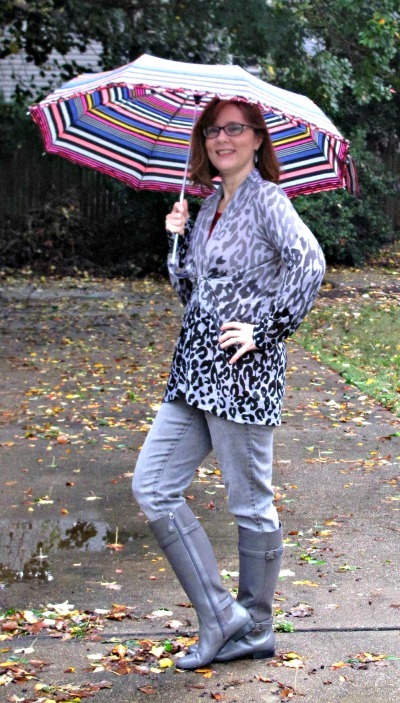 It is really easy to pull an outfit together with such a unique color when you have a shirt with a print to pull another color and add a jacket. I love printed tops,but have had to get rid of quite a few with my weight loss. I think this is just the thing to search for in my next thrifting venture… I have to add that this grey jacket has been revived from being given away after I washed it in hot water and dried it. It shrank so that it barely buttons on me now! Side view is to show the fun zippers that go from the waist all the way down these fun pants. These skinny’s are by Diane Gilman. They are identical to the Espresso ones shown here, but one size smaller since I am still losing weight… I love this designer and these pants, but I do have to be honest with you that the zippers are not lined on the inside and feel cold against my legs so have to wear them with tights… I don’t know if I will be able to wear them alone in spring and if not , that is a real problem. My husband came home last night and saw these pants on me for the first time and couldn’t stop saying how much he liked them. I feel so blessed to have a supportive husband who notices everything about my weight loss journey and my new style developing… It is so great that all the things that I embrace outside my comfort zone are the things he raves about, even not having any knowledge that it is a stretch for me. I guess I am surprised at how in sync with me he seems to be. I will have to come up with some other ways to style these red-orange pants in the next few months. I know adding neutrals, like black, creme, white, tan and brown would easily work , but will strive to find something more inspiring as well. Any suggestions My Dear Readers? As Always my Dear Readers Your comments are welcomed and appreciated!